Healthy hormone levels mean healthy hair growth. When your hormones are out of balance, your whole body will be affected and also your hair. Sometimes losing hair is the first symptom of hormonal imbalance and other diseases. It's imperative to go to your doctor for a check up if you have significant hair fall ( more than 100 strands a day) or thinning or weak hair.What I observed in my practice as a doctor was the fact the we correct the thyroid imbalance with the right medication and we do not see the hair growing back as expected. The article below will help you to understand all the factors that need to be correct to see results in the hair. I always had very thick curly hair. Around the age of 30, I started noticing my hair clogging the shower drain from time to time. However since I still had so much hair, it wasn’t high on my personal list of worst hypothyroidism symptoms. Then all of a sudden one close look in the mirror last year at age 43 changed all that. As I was brushing my hair something caught my eye in the mirror. Wait…is that my scalp was showing through? My hair was noticeably thinner on both sides of my head above my ears, front, and at the temples. My gut reaction was a scream, then tears. Hey Thyroid, Do NOT mess with me. I went into deep research mode, searching for every article I could get my hands on related to thyroid hair loss. Now my hair appears fuller, far less scalp shows through, baby hair has grown back at my temples, and the rate of hair loss has dramatically slowed down. I’m so thankful. Yes, I know that may sound vain to be focused on my physical appearance but losing my hair was devastating to me. I have a feeling I’m not alone. Please note that I am not a doctor. I’m just sharing the ten things that worked for me in the hopes that you will discover what works for you too. As with all things, in particular, supplements mentioned at Hypothyroid Mom, consult with your doctor to be sure they are right for you and that you are taking the right dosage for your body. Our physiology is unique so what works for each of us will be unique too. Every part of the body requires thyroid hormone for proper functioning, and that includes the hair follicles. In 2008, the Journal of Clinical Endocrinology and Metabolism presented the first evidence that human hair follicles are direct targets of thyroid hormones. This research demonstrated that the thyroid hormones T4 and T3 modulate multiple hair biology parameters from cycling to pigmentation. You’ll notice that I bolded the words thyroid hormones T4 and T3. Why is this so important for those of us with hair loss? In mainstream medicine, Levothyroxine drugs are the gold standard for the treatment of hypothyroidism. While these drugs work for some people, they fail for others. Levothyroxine drugs contain T4 thyroid hormone only. Our bodies are supposed to convert that T4 thyroid hormone to the active T3 hormone our cells need. For some of us, our bodies don’t convert T4 to T3 properly, leaving us symptomatic. This is why many of us do better on a combination of T4 and T3 thyroid hormone replacement treatment. The noticeable hair loss was a red flag for me that I needed to get to my doctor for thyroid testing. I’m on the natural desiccated thyroid Nature-thyroid plus a compounded time-release T3. My doctor did comprehensive testing including the essential thyroid tests TSH, Free T4, Free T3, Reverse T3, and thyroid antibodies. Turned out, my Free T3 was middle of the range. I feel terrible when my Free T3 is low or even middle of the range. Optimal Free T3 for my body is when it reaches the top quarter of the normal range, so adjusting my thyroid medication dosage was an essential piece to my thyroid hair loss. What is optimal is individual, and it’s about finding what’s right for you. There are many different thyroid medication options. Finding a doctor open the treatment options to find what is right for you is key. Sadly not all doctors are open to the options, and it can be a very frustrating journey. I’ve put together resources to help readers locate great thyroid doctors across the globe. While optimal thyroid treatment was an essential piece of the puzzle, there were additional pieces critical to my hair loss solution. Low ferritin (the stored form of iron) is one of the most common causes of hair loss in women. Given low ferritin is also a common problem for hypothyroid people, it is important to have iron testing including ferritin especially if you are experiencing hair loss. It is not enough to be told by your doctor that your iron levels are ‘normal.' Ferritin levels are not always tested. Get a copy of your lab results and be sure ferritin has been specifically tested. Even if ferritin is within the ‘normal’ range that doesn’t make it ‘optimal’. Correct ferritin levels maximize your hair’s “anagen” or “growing” phase and encourage your hairs to grow to their full length. When you aren’t getting enough iron through your diet, your body takes ferritin stored in non-essential tissue, like your hair bulb, and gives it to essential tissue, such as your heart. Because your hair bulb is where all your hair cells are produced, this leeching of ferritin can cause your hair to shed before it reaches its maximum length. The average reference ranges for ferritin are 14-170 micrograms per liter, but our research shows that ferritin should be at least 80 ug/L (micrograms per liter) in women for hair follicles to function at their best. Treating low ferritin was another major piece of my hair loss solution. I tried various iron supplements, and many of them gave me digestive issues including constipation. With a life-long history of constipation, that was the last thing I needed. I have personally found that iron in the form of liver concentrates such as the brand Carlson Labs Buffalo Liverworts well for my body. My doctor regularly tests my ferritin to be sure I am taking the right dosage of iron supplements for my body and that I’m not taking too much because over-dosing on iron can be dangerous. I’m careful to take iron supplements including multivitamins with iron at least 3 hours apart from my thyroid medication to ensure the iron doesn’t interfere with the absorption of my thyroid medication. I read a fascinating interview with Dr. Jonathan Wright by Suzanne Somers Honey; I Shrunk My Ponytail! Turns out this article would change the fate of my hair. DR. WRIGHT: If stomach acid is low, protein isn’t efficiently digested – and hair and nails are made up of… protein! If we are deficient in protein, our bodies know that we can live without hair or nail proteins, but we can’t survive without heart muscle proteins or other important body proteins. So if we are short in supply of protein, the hair or nails are the first to go. Turns out low stomach acid results in malabsorption of iron (which as you know is necessary for maintaining our hair) and many other essential nutrients. Thanks to this article I discovered my own issues with low stomach acid and now take this Betaine Hydrochloric Acid with Pepsin just before heavy meals containing protein. This has also helped me personally with heartburn, gas, acid reflux, and bloating. There are two additional ways that I increase my low stomach acid. Every morning before breakfast I drink warm water and lemon. Before the larger meals of the day I take 1 tablespoon of apple cider vinegar in water. I use Bragg’s Apple Cider Vinegar. This raw organic apple cider vinegar contains the ‘mother’ of the vinegar. The ‘mother’ is made up of beneficial living nutrients and bacteria. Another option is to take digestive bitters. Nutrient deficiencies are a common issue for those of us with hypothyroidism. Not only are nutrients essential for thyroid function, but they also play an important role in keeping the hair on our heads from falling. A good quality multi-vitamin is important and, of course, a healthy diet is essential, but still nutrient testing is important because many like me will require additional supplementation to bring us to optimal. Testing should include zinc, vitamin D, B12, and magnesium (for each nutrient listed I attached an article that explains its connection to hair loss). Nutrient deficiencies are an issue for me personally. I supplement every day to maintain my nutrients at optimum. When I noticed a worsening of my hair loss last year, nutrient testing revealed that I was deficient in all those nutrients necessary for hair health. Did you notice that I highlighted thyroid medications on that list? I’ve heard from many readers who had sudden worsening of their hair loss when they started one or another thyroid drug brand. Think back to the start of your hair loss, did it happen at the same time you started a specific thyroid medication? How Vida Homeopathy Hair stimulate a Healthy & Strong Hair? The homeopathic compositions of Vida Hair Shampoo + Vida Hair Lotion stimulate scalp circulation + immune defense ( control of unwanted microorganism in the scalp). Increase of Circulation + Strong Defense = A better Hair nutrition + Healthy Scalp = Hair Grow Fast & Strong. 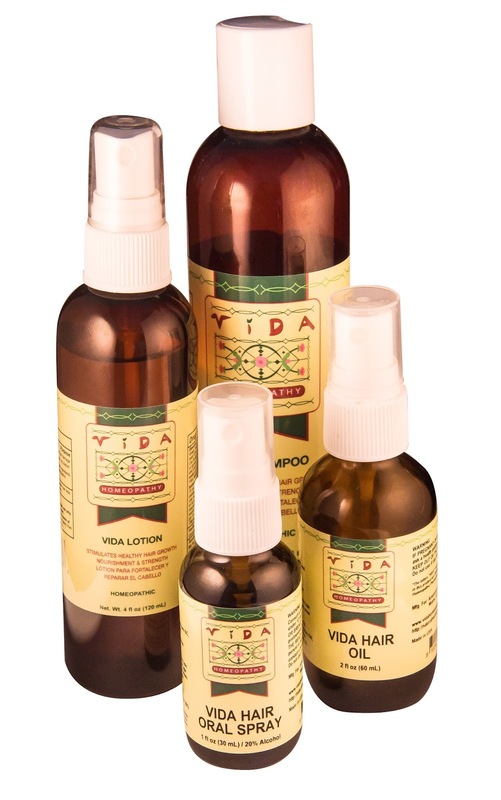 Vida Hair Oil = Nourish the scalp, enhance the natural defenses and circulation. Nourishment of the scalp and repair the damage strands. Vida Hair Oral Spray a compound of classic homeopathy remedies for Hair Loss and Stress.